A while back, I did a review of the Cold Steel Kudu, Lynn Thompson’s modern take on the South African Okapi 907. Within that article, I made some statements concerning the quality and reliability of the traditional Okapi which were based on personal research and input from South African friends experienced with the Okapi. After reading my review, CAS Iberia, an importer of authentic South African Okapi knives sent me a couple Okapi 907 models to review, hoping to change my opinion of this South African classic. Different regions of the world are often known for a particular knife or knife design. In Switzerland, it is the Swiss Army Knife, in Sweden, it is the Mora, and in Africa, it is the Okapi. The original Okapi was produced in Solingen, Germany in the early 1900s for export to the German colonies in Africa. The name comes from a unique, endangered African animal that has the face of a deer, the shape of a giraffe, and the stripes of a zebra on it legs and hind quarters. In 1988, All Round Tooling (aka Okapi South Africa) purchased the trademark and tooling and moved production to South Africa, where production takes place in the small village of Isithebe, north of Durban. To those initiated into the blade arts, the Okapi is easily recognizable as the knife of the Piper System. Although much more refined in its current state, Piper originated essentially as a research model into the movement and methodology of the Cape Gangster, for the purpose of learning effective defense against this knife-wielding criminal element. The popularity of the Okapi amongst the South African criminal element has earned it a somewhat nefarious reputation, to the extent that it has been dubbed the “Saturday night special” of knives. While its history is colorful and fascinating, the real question is whether this inexpensive knife that has garnered a cult-like following over the years can overcome the hype and prove to be a knife worthy of its stature. The 907 is made using what the manufacturer describes only as “carbon steel.” My research suggests the steel grade used in most Okapis is 1055. 1055 is a plain carbon steel that has about a 0.55% (0.5% – 0.6%) carbon content. It is a good hard-use steel that is commonly found in machetes, tomahawks, throwing knives, and swords because of its toughness and survivability against repeated impacts; however, due to its relatively low carbine content, it is often found lacking in the edge-retention category. At first glance, the untrained eye might take the 907’s 104mm stamped blade as having a flat grind (the word “grind” being used loosely, since it is not actually ground), but it is in fact chisel ground with a right-side bevel. The thinness of the blade (2.5mm) and the presence of double-sided micro-bevel makes this difficult to detect. It is a secret that is only revealed by the very slight plunge line on the bevel side. The factory edge had much to be desired and required some intervention to make it functional. I was able to put a very sharp edge on it, though. The finish of blade spine was pretty rough. It had a depression that ran the length of the blade, with small, visually detectable grooves running perpendicularly. The blade finish had a fair polish. One of the knives had a small, unintended divot in the left side of the blade, serving mostly as a cosmetic flaw. The banana-shaped handle of the 907 is 137mm long and made from two pieces of resin-impregnated wood. A decorative but rough moon and stars metal inlay accents the wood on the left side. The wood spacer behind the lock spring had a slightly rough fit with some dark discoloration. It is difficult to determine whether this dark color is a result of the epoxy resin holding it together, or if the wood was burnt during sanding. Considering it was present on both knives, and the other Okapis I have seen, I am leaning more toward the resin as the culprit. The handle is thin and narrow, but not uncomfortable in the hand. The absence of any sort of guard makes it so that the user can adjust their grip along the handle, but obviously adds the danger of the hand slipping up onto the blade during any type of thrusting action with the knife. This is inherent with the ring-lock design in general and is not specific to the 907 or the Okapi brand. Just realize that this knife is designed for cutting, not thrusting. The 907 utilizes a ring-lock mechanism (different from the rotating bolster found on Opinel Knives). A ring-lock is kind of like a back-lock in function, except instead of pressing down on the back of the locking bar (rocker bar) to release the lock, you pull up on the ring located near the front of the locking bar. This mechanism is composed of stamped metal and is completely external. The reliability of the locking mechanism was one of the criticisms I gave of the Okapi in my review of the Kudu; however, the lockup on the two 907 samples I received was quite decent. Blade deployment requires two hands to do safely. There is a technique for utilizing a one-hand deployment, but this requires modification to the locking mechanism to decrease the spring tension on the lock. Not something I recommend. There is also some play in the blade as there are no spacers present. In fact, placing a moderate amount of lateral tension on the Blade will cause the thin handle to flex above the small pivot pin, indicating that a reasonable amount of leverage against that joint will likely cause the handle to snap. The tang of the 907 has several notches which give it a “ratcheting” effect when opening and closing. These notches are there to prevent the blade from snapping closed when disengaging the lock, which requires the user to pull on the ring while simultaneously pressing against the back of the blade. The safest way to disengage the lock is to place your index finger through the ring and brace your thumb against the spine of the blade, then pull the ring and push against the blade. 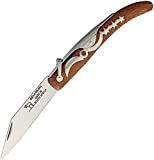 Interestingly, because of the locking mechanism design, this style of knife is known as a “ratchet knife” in Jamaica, where the Okapi is the most popular version. As a collector and enthusiast of weapons and tools of the world, I find the Okapi 907 to be both fascinating and attractive in its own special way. It is not a high-end knife, nor is it a high-quality knife. It is what it is, and that is an inexpensive workman’s knife. Its rough features and cosmetic flaws are the very thing that I find attractive about this knife. This would not be a knife that I would seek out for everyday use. In fact, I stand by my original argument that the Cold Steel Kudu is superior to the Okapi 907 in every aspect. The Kudu has a superior level of quality, durability and reliability, is more aesthetically pleasing, as is more reasonably priced. No, for me the desirability of the Okapi 907 comes from the feeling of owning an iconic piece of history that only comes with owning an authentic Okapi with all its flaws and shortcomings. Let me leave you with a final word of caution concerning ring-lock knives. While working on this review, I was comparing the lockup of the Kudu and the 907. During my examination of the Kudu, I found myself at a point where I could not get the lock to disengage using the technique I described earlier (even though I have done this a hundred times before) because the spring tension was so tight. To get some added leverage, I placed my left hand on the back of the blade, keeping my fingers and thumb straight so as not to let them get in the way of the blade, and kept my right index finger and thumb in their original position. When the lock finally disengaged, the knife turned clockwise and the blade rotated inward on the ring, bypassed all the safety notches, and closed on my thumb. The result was a deep ¾” laceration and a trip to the ER. An exciting way to learn how NOT to close a ring-lock knife. I recommend purchasing the Okapi 907 at Amazon. Please consider that purchasing anything through any of the links on this website helps support BladeReviews.com, and keeps the site going. As always, any and all support is greatly appreciated. Thank you very much. There is a knife in South Africa known as the Okapi. Originally produced in Germany in the early 1900s for export to the German colonies in Africa, the trademark and tooling was purchased by All Round Tooling (aka Okapi South Africa) in 1988 and all production moved to South Africa. Made from high carbon or stainless steel, the Okapi is known as a workman’s knife due to its price and availability. For the same reasons, the Okapi is quite popular with the criminal element in South Africa. The fighting systems of various peoples are always influenced by external factors. (I discuss this in detail in my book, Solving the Enigma: Insights into Fighting Models if you would really like to delve into this topic.) One of those influencing factors is weapon technology. The defects in the Okapi can be seen through the Cape Knife Fighting methods used by the criminal element of South Africa. The Okapi has an unreliable ring-lock locking system and a dull blade that refuses to take or hold much of an edge. As a result, the knife is used in a reverse grip with the edge facing inward. Holding the knife edge inward ensures that in the event the lock fails, the blade will not collapse onto the user’s fingers. The blade is used to deliver ripping stabs since slashing and cutting strokes are rather ineffective. Lynn Thompson of Cold Steel has a reputation for taking historical weapon and blade designs and reworking them with modern materials and Cold Steel technology to turn them into fully functional and virtually indestructible renditions of their ancestors. That is exactly what Cold Steel did with the Kudu, their reconstruction of the classic Okapi. The flat ground Kudu blade is constructed out of German 4116 Stainless Steel. Unlike the Okapi, the 4 ¼” blade of the Kudu is razor sharp right out of the box. The blade is thin in the tradition of the original Okapi, measuring at only two millimeters thick, and has an image of a kudu (a species of South African antelope) printed on the blade. The blade is most likely stamped out and then ground in the fashion of many Swiss Army Knives, rather than CNC machined, which gives it a little bit of a third-world feel to it. The blade is perfectly centered, but there is a bit of side-to-side play which is most likely due to the type of spacers used. The entire knife is a whopping 10 inches long—not a small knife by any means. Lynn Thompson likes big folding knives and it shows that he did not take any exception with the Kudu. This knife is surprisingly light, however. At only 2.4 ounces, this knife feels like a feather in the hand. The clip point blade of the Kudu is extremely sharp out of the box. I did some quick paper cutting tests with it and it performed superbly. Not having a lot of experience with Krupp 4116, I had to do a little research on this particular steel’s properties. Although all of the Internet commandos have their own opinions, but as far as metallurgy is concerned, 4116 is a modified form of 420C and is said to be on par with 440C for edge retention characteristics, but has a better corrosion resistance than 440C. So far, I would have to say that the Kudu’s edge retention has been pretty close to most of my 440C blades. The curved handle of the Kudu is made from what appears to be two pieces of black zytel (Zy-Ex) fused together to form one piece. With the exception of the pivot pin, all of the handle hardware is external. The handle has a decorative metal kudu horn inlaid into the left side and a wood grain texture. The faux wood grain texture on the handle adds to both the appearance and grip of the handle. The lack of any type of finger grooves means you can extend or choke up on the grip without any discomfort; however, with the absence of any kind of guard or quillon, this is not a knife that you would want to use for stabbing. The Kudu does not have any type of pocket clip to facilitate carrying (Man, have we gotten spoiled or what?). The handle of the Kudu is so long that it actually carries fairly well in the back pocket of a pair of jeans, or in the front pocket along the seam. For an average size person, the ring will actually rest at the top of the pocket. Allowing the ring to sit just outside the pocket will put the knife within easy access. I performed some testing on the locking mechanism to see just how reliable it is. I gave it five solid spine whacks and five radius hits just below the tang. The blade remained solidly locked with no signs of compromise. I have no doubt the ring-lock on this knife is solid and dependable. Kudu deployment requires two-handed opening using the thumbnail groove on the blade. Like the Okapi, the Kudu has a ring-lock, but one that actually works. For those who may not be familiar with this type of locking mechanism, a ring-lock is similar to a back-lock in function, except instead of pressing down on the back of the locking bar (rocker bar) to release the lock, you pull up on a ring near the front of the locking bar. Also, with a lock-back, the locking bar is inside the frame and fits into a cutout in the tang and locks the blade, whereas with a ring-lock, the locking bar is external and has a cutout that a notch in the tang fits into to lock the blade. Of course, this type of ring-lock system is completely different from the ring-lock system used by Opinel Knives, which involves rotating the bolster. The lockup on the Kudu is quite strong. It takes some effort to disengage the locking bar. Again, for those not familiar with a ring-lock, there is some technique involved in closing this knife. Failure to use the proper technique could wind you up in the emergency room having your fingers stitched back together. To close the Kudu, you place your index finger through the ring and brace your thumb against the spine of the blade, then pull the ring and push against the blade. The tang of the Kudu has several notches that act as safety stops to prevent the blade from closing too quickly, but it is still important to keep your fingers clear of the blade’s path. There are some techniques for modifying the Kudu to open and close a little smoother, but I will not discuss them here since this is done at the cost of some of the knife’s locking integrity. An interesting side note on deployment is that South African gang members will carry the Okapi partially open in the back pocket so that when it is pulled out by the handle, the tip of the blade catches on the seam, in the fashion of an Emerson Wave, and opens the blade. This works because of the dull blade and weak spring of the Okapi. If you tried this with the Kudu, you would end up with a partially opened knife and half of a back pocket. The Cold Steel Kudu is not a high-end tactical knife by any stretch of the imagination. It is well designed and well built, but it does feel cheap—because it is cheap. The Kudu retails for $9.99, but can usually be picked up for about $6.00. For a utility knife that can be used in the kitchen or thrown in the bottom of a tackle box, the Kudu is hard to beat on price alone. It blows away any knife you might buy at your local retailer for even double its retail price. I typically carry high-quality, hard-use tactical knives on a daily basis since my primary purpose for an EDC knife is self-protection. With that being said, the Kudu will definitely not become my new EDC knife as it is neither designed to be nor intended to be a tactical knife, but I will definitely be throwing one in my utility drawer and probably one for a spare blade in my bug-out bag. I recommend purchasing the Cold Steel Kudu at Amazon. Please consider that purchasing anything through any of the links on this website helps support BladeReviews.com, and keeps the site going. As always, any and all support is greatly appreciated. Thank you very much.